Woohae Cho/Getty ImagesAnti-North Korean activists burn Kim Jong-un’s portrait while the North Korean ferry, Man Gyong Bong arrives at Mukho Port in Donghae, South Korea on February 6, 2018 in Donghae, South Korea. 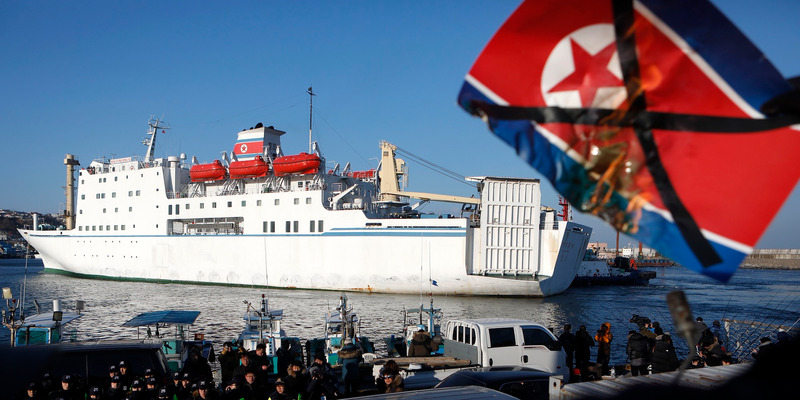 The North Korean delegation’s travel involved Seoul temporarily exempting sanctions on North Korean ships. North Korea asked South Korea to supply fuel to the ship that its art art troupe is using for travel and accomodation, Seoul’s unification ministry said Wednesday, according to Yonhap news agency. The ship transported the troupe a day earlier. Earlier this month South Korea suggested using a ship to house the North’s Olympic delegation, as it had done in the past. “The government will make efforts to make sure any provisions are not a possible violation of international sanctions through close consultation with the US and other countries,” the ministry spokesman said. Some have suggested that South needed to ease its sanctions temporarily in order to facilitate the North’s Olympic delegation and encourage inter-Korean cooperation.